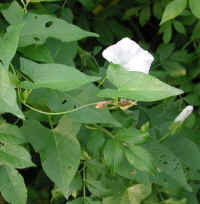 (Hedge Bindweed (Convolvulus sepium) - 01) As the name implies, hedge bindweed is a twining vine that supports itself by binding to other plants. 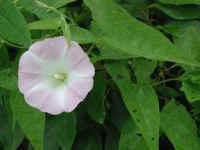 Because of this, it is easy to mistakenly think the flower belongs to the supporting plant. 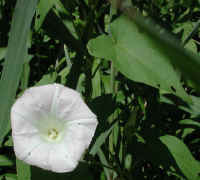 The sagittate (arrow-shaped) leaf to the upper right of the flower belongs to the hedge bindweed. 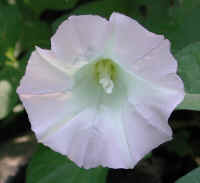 (Hedge Bindweed (Convolvulus sepium) - 02) The flower of the hedge bindweed is 2-3 inches in diameter, and is composed of 5 petals that are united to form a funnel-shaped corolla. 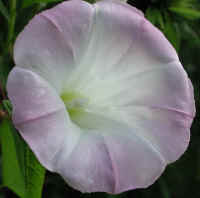 (Hedge Bindweed (Convolvulus sepium) - 02a) At first glance, the 5 stamens and 1 pistil of the hedge bindweed look like a single column rising from the center of the cup of the flower. This bee's eye view show they are separate. 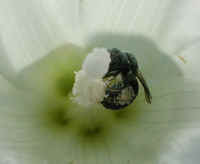 The pistil grows from the central ovary. 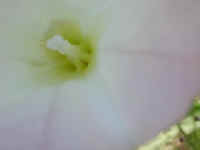 The stamens grow from the base of the ovary, one coming up through each of the 5 cavities. 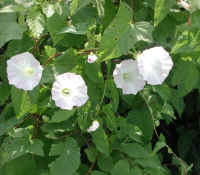 (Hedge Bindweed (Convolvulus sepium) - 03) The hedge bindweed blooms from May through August. 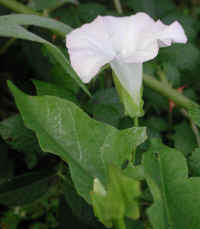 (Hedge Bindweed (Convolvulus sepium) - 04) This photo gives us another look at the flower and arrow-shaped leaves of the hedge bindweed. 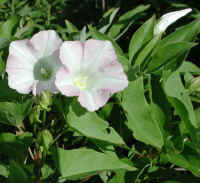 (Hedge Bindweed (Convolvulus sepium) - 05) If one hedge bindweed flower is beautiful, then two are even more so. As we come to appreciate one aspect of God's creation, we should come closer to appreciating the whole of creation and strive to protect it. 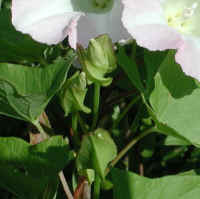 (Hedge Bindweed (Convolvulus sepium) - 06) In this photo, we can see fully opened hedge bindweed flowers, one just ready to open (upper right) and new buds (below flowers). 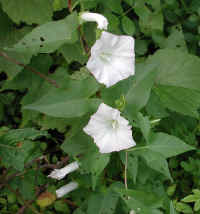 (Hedge Bindweed (Convolvulus sepium) - 06a) This is an example of how the hedge bindweed flower can be mistakenly thought to be the flower of another plant. 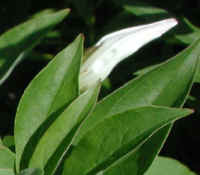 In this case, the leaves belong to the supporting bush. 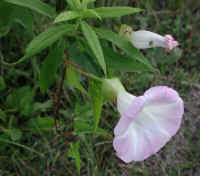 (Hedge Bindweed (Convolvulus sepium) - 06b) Two of the ways to help identify the hedge bindweed are by the two upside-down heart-shaped bracts that can be seen on opposite sides of the buds. 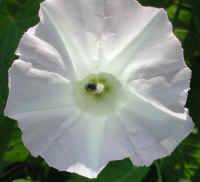 The other distinguishing factor is that the stems are smooth, unlike a morning glory which has hairy stems. 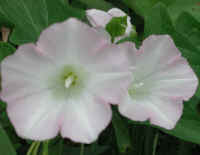 (Hedge Bindweed (Convolvulus sepium) - 07) The flowers of the hedge bindweed may be either white or pink. 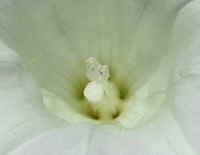 (Hedge Bindweed (Convolvulus sepium) - 08) In this close up picture, we can see the yellow center, which occurs in some of the hedge bindweed flowers. 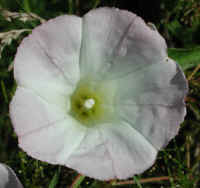 (Hedge Bindweed (Convolvulus sepium) - 09) This is another hedge bindweed. 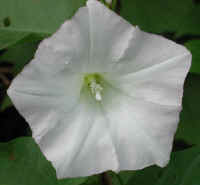 The scientific name of bindweed comes from the Latin word "convolvere", which means "to entwine". (Hedge Bindweed (Convolvulus sepium) - 09a) In this photo, we have a sideways view of the heart-shaped bracts on the flower bud (above flower). 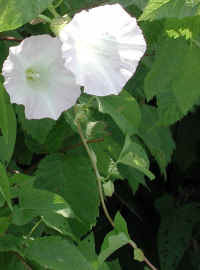 Even though the hedge bindweed is a member of the morning glory family, it is a separate species. 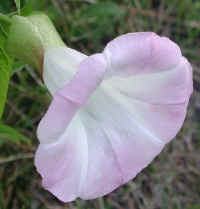 The morning glory does not have these heart-shaped bracts. 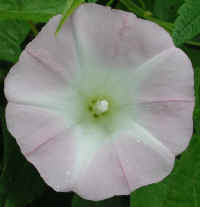 (Hedge Bindweed (Convolvulus sepium) - 10) Usually the hedge bindweed flowers have a more rounded corolla, but this one has a distinct pentagon shape. (Hedge Bindweed (Convolvulus sepium) - 11) This hedge bindweed is more easy to identify because it is growing on the outer surface of this bush. (Hedge Bindweed (Convolvulus sepium) - 11a) In this photo we can see the smooth stem, the alternating leaves, and the solitary flower buds that grow from the leaf axils. 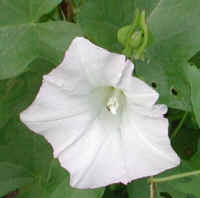 All these characteristics help identify the hedge bindweed. 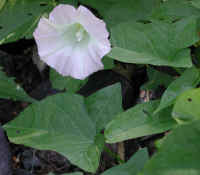 (Hedge Bindweed (Convolvulus sepium) - 12) This hedge bindweed has a visitor. 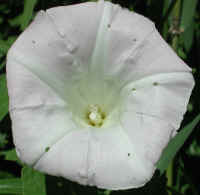 (Hedge Bindweed (Convolvulus sepium) - 13) The hedge bindweed's visitor is actively gathering pollen. 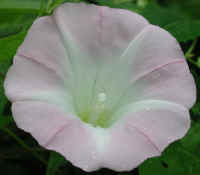 Some of the pollen grains will be deposited on the stigma at the tip of the pistil of other bindweed flowers and fertilize the seeds. (Hedge Bindweed (Convolvulus sepium) - 15a) This is a bee's eye view of the center of a hedge bindweed flower. 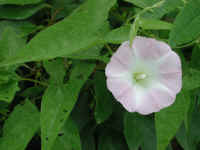 (Hedge Bindweed (Convolvulus sepium) - 22) We took this and the following photo of the hedge bindweed in August of 2010 while on one of our walks. 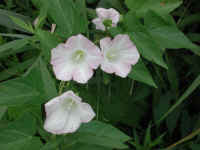 (Hedge Bindweed (Convolvulus sepium) - 23) This is the other photo we took of the hedge bindweed we took in August 2010.